THE UNEMPLOYED EATER: Sweet Rose Opening on Main Street Santa Monica. Dollar Scoops Friday. Sweet Rose Opening on Main Street Santa Monica. Dollar Scoops Friday. One of the LA's more superior scooperies, Sweet Rose Creamery, is expanding within its home city. 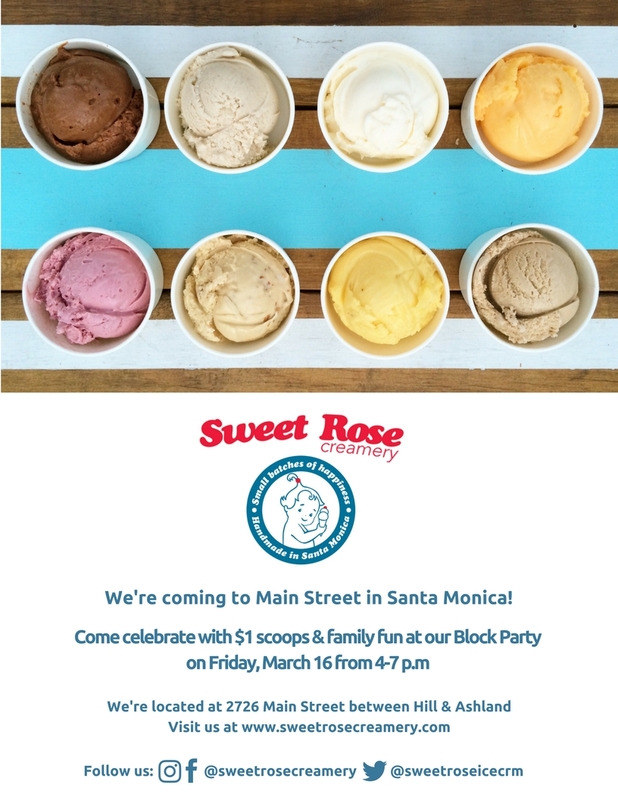 The purveyors of the best Salted Caramel ice cream in town take over the vacant Three Twins spot on Santa Monica's Main Street at 2726 Main Street, between Hill & Ashland. Located across the street from the popular all day eatery, Ashland Hill, the new Sweet Rose is a junior varsity stone's throw from their Pico location (not to mention its first location in the Brentwood Country Mart), but in a far more desirable lick-while-you-walk environ. To celebrate the new locale's commencement, this Friday, March 16, they're offering $1 scoops to all from 4-7 pm.